It’s that time of the year again, when everyone in the tabletop gaming industry tags everything on their to-do lists as “must be done before” or “can wait until after” – GenCon! Otherwise, I am likely to be found at the Green Ronin Publishing booth, hawking copies of Fantasy Age, Titansgrave: Ashes of Valkana, Mutants & Masterminds, A Song of Ice & Fire Roleplaying, my own Icons Superpowered Roleplaying, and other fine Green Ronin products. If you have a specific need to meet or talk with me, you can drop me a line about setting up a time or come by the booth and take you chances. One of the things I very much looked forward to at GenCon this year (after a year away in 2013) was the third-annual “Queer as a Three-Sided Die” seminar. It got started, as such things often do, to address a need that the initial panelists and I perceived — it is, in many ways, the seminar I wish I’d had during my early years at GenCon, when the notion that there were other “gaymers” was completely foreign (I didn’t meet any until around my sixth or seventh year of attending). The Know Direction podcast was also kind enough to create a video recording of the panel, so I’ll direct you there if you want to see and hear everything that was discussed. Topics ranged across the queer spectrum from the light-hearted and celebratory to quite serious and emotional, and Qd3 (as I abbreviate it) was by far the most well-attended seminar I experienced at GenCon. 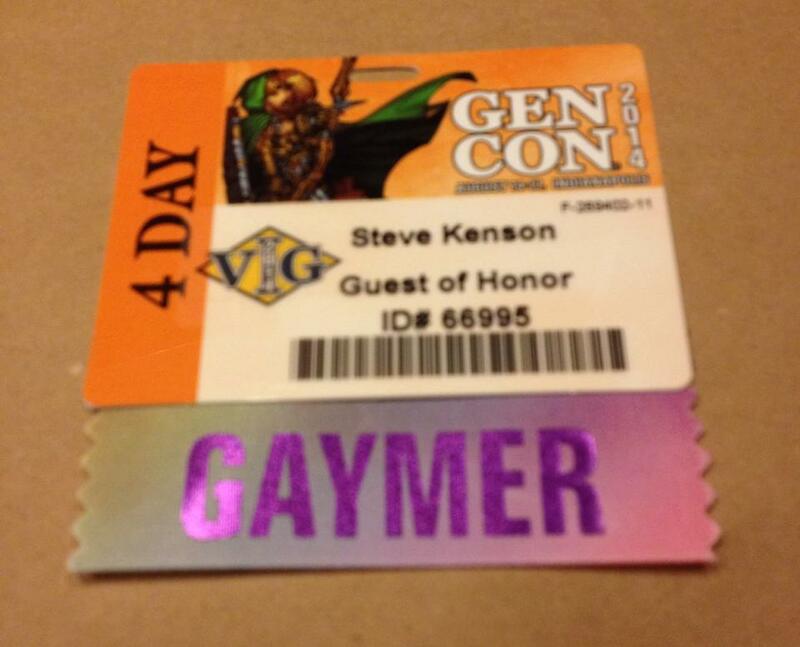 We also had the benefit of “GAYMER” badge ribbons from Tabletop Gaymers again this year. Feel free to check out their consolidated reference links, and to register or donate to the covering the cost of the ribbons this year and for next year, as they were quite popular! Members of the gaymer community are already talking about adding to the slate of offerings for next year’s GenCon—social events, seminars, gaming events, and so forth—and I’m already looking forward to the potential for next year’s panel. If you are interested in joining us as a panelist, or know someone you think would make an ideal panelist, please email me and let me know! If you have ever considered the possibility of offering something queer-related or more inclusive at a convention (GenCon or any other)—do it! Like I said, these things get started because we see a need and look to fill it and, let me tell you, the need is there. I’m already looking forward to all the amazing things our community is going to do in the years to come. Should you plan to be at either convention, please do check out my various events, or just take the opportunity to say hello. I look forward to seeing many of you there!